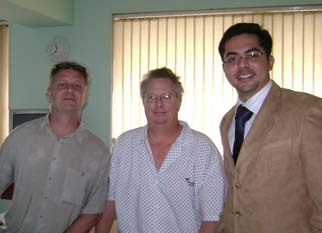 After waiting for surgery for two years in the NHS, I was sent by our family Physicians in India to Dr. Dheeraj Bojwani. An initial arthroscopy was undertaken which demonstrated osteoarthritis in both knees. Unfortunately because of the extent of the arthritis I had continuing pain, stiffness and restriction in my activities and ability to work. I therefore underwent at total knee replacement in India. At this time I was aged fifty four which was very young for a knee replacement. Dr. Dheeraj Bojwani therefore arranged one of the new Oxinium total knee replacements in India. This was inserted using cement. I recovered well and started walking on the second post operative day and was discharged after a week. I made such good progress that. When reviewed six a week later I had a range of motion of 0º to 125º on both sides, no pain, swelling and was walking comfortably without any support or sticks. I was advised that I can return to gentle activities including gentle sports. Since then I have returned to full activity and is essentially unrestricted. I said "After waiting for two years to be seen by an NHS Consultant I was delighted to be referred by our family physician to Forerunners Healthcare Consultants. My experience was excellent; I would definitely recommend Dr Dheeraj Bojwani and the Forerunners Healthcare Consult to other patients." When asked about undergoing knee replacement at such a young age I responded by describing the difficulties I had with the pain and stiffness in the knee. "To be relieved of the pain has enormously improved my life." I was able to receive one of the new cemented oxidized Zirconia’s total knee replacement surgery in India. This knee has been used for five years in the USA but is new in India. It uses a new technology to reduce the wear in the knee by up to 85%. Because of its very young age Dr. Dheeraj Bojwani was able to recommend this type of knee replacement for the potential increase in the life of the knee replacement surgery in India.